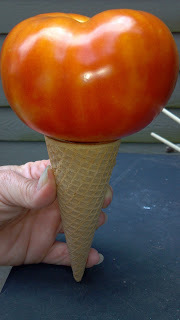 Not even tomato ice cream! I have an ulcer and can't eat the tomatoes. I couldn't make this stuff up, really. The first of hundreds of tomatoes is just beginning to show orange. All the people who planned on stealing them and all the plans I made to thwart them... We were all enjoying the anticipation like Christmas. Alanis Morissette's song Ironic played on the way home from the doctor. They also said no caffeine including chocolate! Seems some new research shows people can survive without chocolate. They are not technically alive though. No ice cream either! In July! last week when Bully the chicken escaped and I threatened to shoot her with a BB gun if she ate the tomatoes. She heard me and decided to just dig them up. Ha! Capture! Now I have a mountain of tomatoes and indigestion. It has rained all year. I mowed and mulched. We lost the basil. The tomatoes were the only thing that benefited. The plump, red lining to the gray cloud that has blocked out the sun for months. I am not at all interested in canning anything. Don't go there. I have a hole in my stomach. Burned fingers won't help that. I can make sauce and freeze it. Freezers are on sale. I'll get two. Enough to store Tomato Mountain. We'll have pumpkins in a couple months too. They are not on the "Good Foods" list OR the "Evil Foods" list. No list can hold them. They are too heavy. Barring any new allergies or laws prohibiting the growing and possession of pumpkins, pumpkins may keep me alive. There's a hole in my heartburn that only tomatoes can fill. Bummer. Without fresh tomatoes and caffeine and chocolate, I'd probably go crazy, like crazy crazy.